Mondo, in partnership with Acme Archives, continues its beloved Star Wars Portrait Series by Mike Mitchell this weekend with two new characters from a galaxy far, far away! This release includes Han Solo, disguised as a Stormtrooper to infiltrate the Death Star (rescuing Princess Leia Organa from Imperial captivity), and his Wookiee companion Chewbaccca! 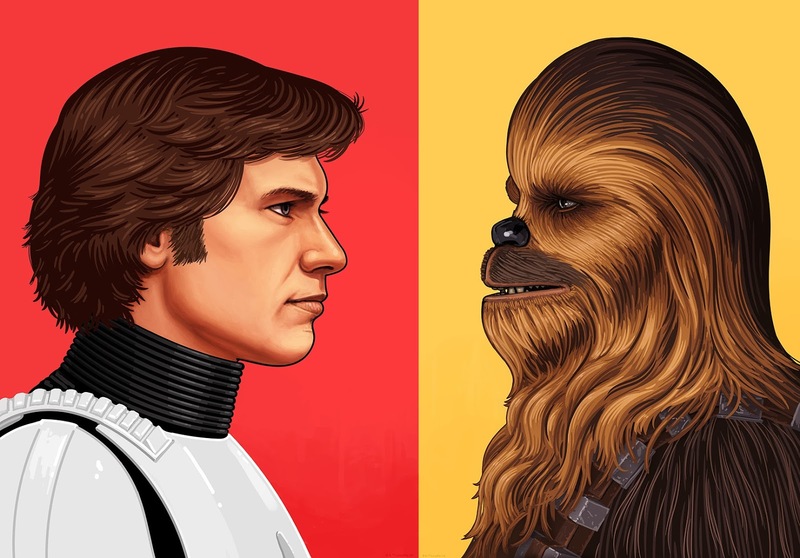 “Han Solo in Stormtrooper Gear” and “Chewbacca” by Mike Mitchell are hand signed and numbered Star Wars giclee portrait prints. Both prints are timed-edition releases, which are available for 72 hours from now through Sunday, September 25th, at 12pm CST. The Han Solo print is 12”x16” and retails for $55, while the Chewbacca print is 13”x19” and retails for $60. Collectors can place their pre-orders for both prints now at the Mondo online store.